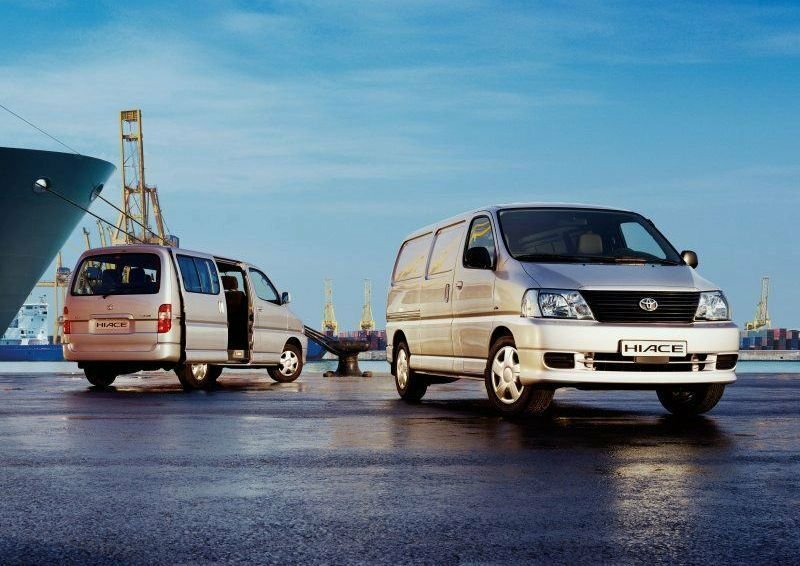 Competing against rivals like the Mercedes Benz Sprinter or Ford Transit has never been easy for Toyota Hiace, and its sales charts never went on fire. But where it may lack in style or technology, the Hiace compensates with a pretty affordable price being a cheaper alternative to its more upscale rivals. 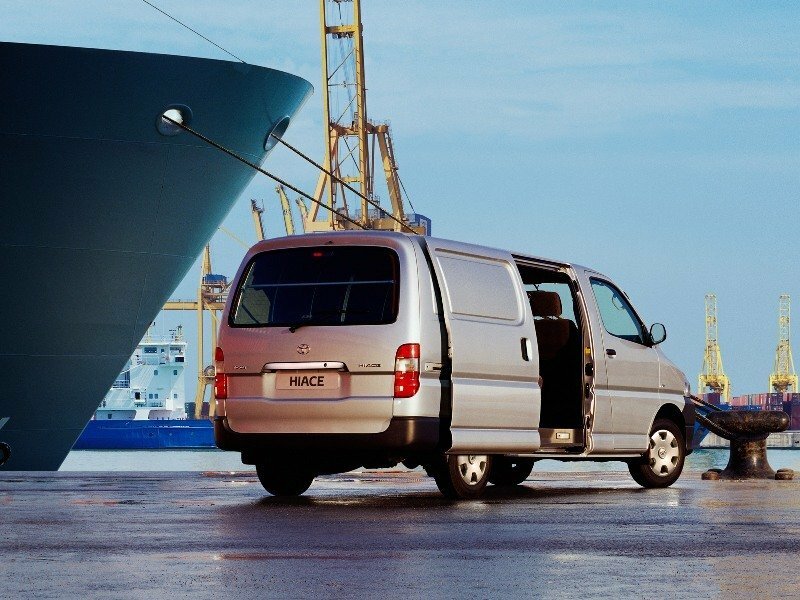 The Hiace is also pretty versatile too, and is available with various wheelbases, engines and body styles. The vehicle is priced at $15.000 and has received its last major revisions in 2007 when Toyota made some upgrades to the engines and the exterior design. With a robust exterior design the Hiace looks pretty similar with the older generation Volkswagen Transporter and if we’ll judge it by today’s standards the verdict would clearly be “Dated”. On the other hand, despite its rather rudimentary appearance, the Hiace has anything it takes to get the job done without any impediments and looks ready to go head to head with its arduous missions. 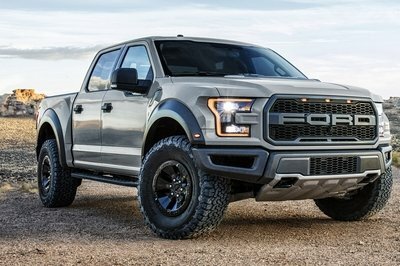 The front radiator grille features a horizontal chromed strip which bares the company’s logo in its center, while the big headlights have a pretty simple design and don’t add any modern touch to the utilitarian appearance of the vehicle. The wraparound black plastic bumper doesn’t has anything to stand out from the crowd either and features a pretty basic shape and a central air intake which was designed to send fresh air to the engine. The Hiace is also available with optional fog lamps which are integrated into the bumper and comes standard with 15 wheels. Compared to the previous generation Hiace, the 2007 position lamp and the turn indicators have been housed under one, clear lens for a more modern look. The prominence of the frontal styling was also enhanced by the increased front overhang, which has been extended by 80mm. To offer a bit of dynamism to its dull-looking Hiace, Toyota added two “V” shaped creases on the hood which manage to break the monotony a bit. The Toyota Hiace can also be equipped with a useful heavy duty load platform which is fixed on the roof with an optional roll-on ladder system designed to make loading, carrying and unloading ladders much simpler. The interior design has the same dated feel as the exterior. The materials seem also much cheaper compared to other vehicles in the segment and despite the fact that the overall built quality is satisfactory, some big panel gaps still surface to spoil the fun. 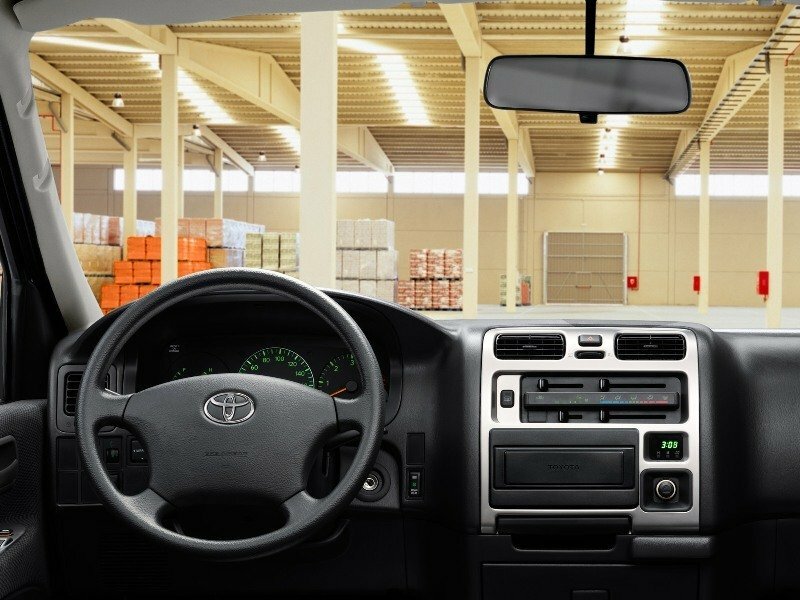 Luckily we don’t have any complains about the controls layout, as they are placed pretty intuitive and within easy reach proving that Toyota used wisely its passenger’s car experience when designing the Hiace’s interior. However a few faults were still left behind, such as the relatively limited cabin space and the gear knob which is floor-mounted rather than dash-mounted. The instrument cluster features two main round gauges and other two additional indicators. Apart from their rudimentary design the gauges are fairly big and easy to read. The vehicle can be equipped with either an advanced optional audio/CD system (which can play MP3 files) or an optional DVD full map navigation mounted into the central console. For your money you get air conditioning as standard along with electric windows and electrically heated and adjustable exterior mirrors. The four spoke steering wheel continues the old look that dominates the entire cabin and it can’t even be compared with today’s units from Mercedes, Volkswagen or even Renault. At least its tilt adjustable and permits you to find a good driving position without too many struggles. The driver’s seat can be also adjusted and it’s surprisingly comfortable without leaving you with any back pains even after a full day of work. The high driving position is also good and thanks to the generous windshield and the plate sized mirrors you have a brilliant view of the road. 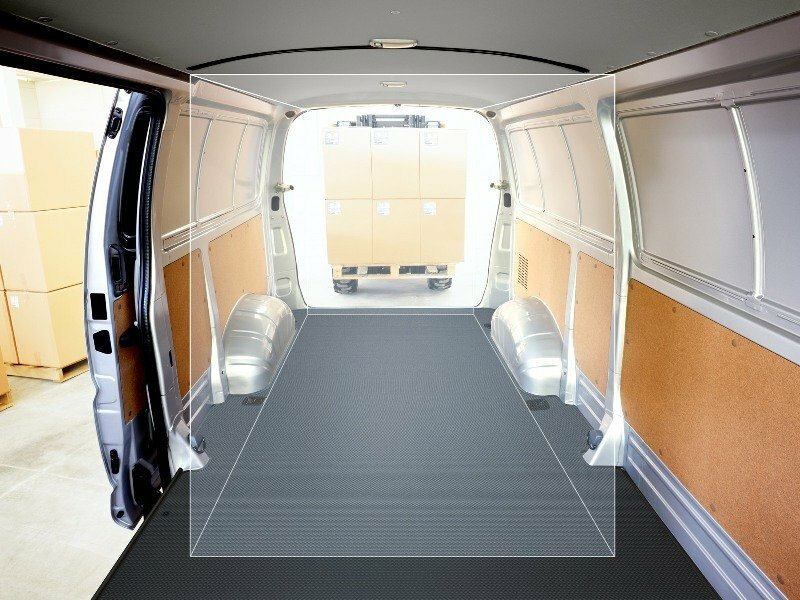 There are plenty of storage recesses to reduce cabin clutter, with document or map storage in the moulded front door pockets and glovebox. 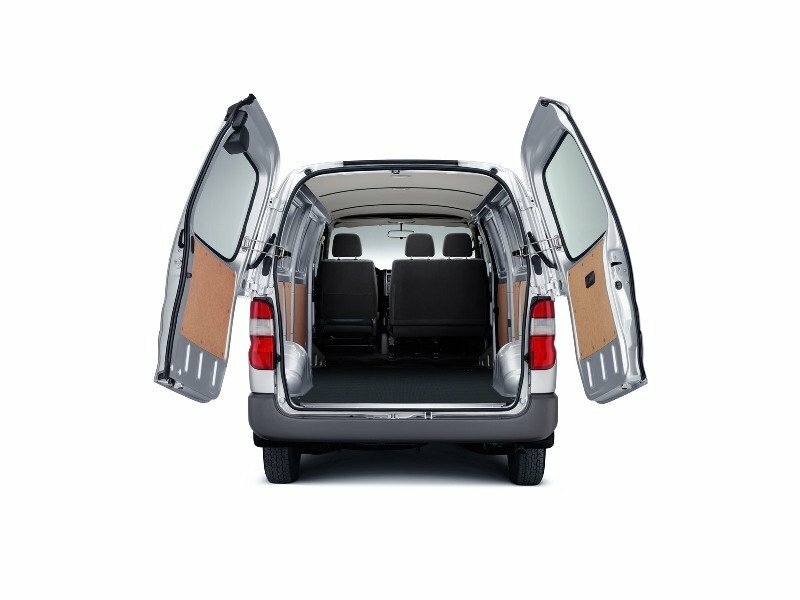 The centre seatback on van models folds forward, offering a handy table with two cup holders and a convenient flat surface. There are also retractable dual cup holders mounted into the dash and bottle holders built into the front door trims. The Toyota Hiace is offered with a standard driver’s airbag and force-limiting driver and passenger seat-belts which work with the SRS airbag to reduce the stress on the upper torso during an accident. In 2007 the Toyota Hiace gained more powerful versions of the 2.5-litre D-4D diesel engine which are available with a choice of either 95 hp or 117hp, both mated on five speed manual transmissions. Both engines comply with Euro IV emissions regulations. The entry 2.5-litre D-4D intercooler is 7 hp stronger than the older unit and achieves its maximum output at 3600 rpm. The torque was also improved and now it comes with 230 Nm achieved between 1400 - 2800rpm. The stronger 117 hp version is also fitted with a high capacity intercooler to maximize operating efficiency. The engine develops a peak torque of 294 Nm across 1600 to 2400 rpm. The Toyota 117 hp version of the Hiace can hit a top speed of 152 km/h, while fuel consumption is rated at 8.5 litres/100 km. The Hiace is equipped with a hard-working double wishbone type front suspension with long torsion bars which offers a pretty forgivable ride being at par with its rivals. The handling however isn’t something to rave about and the standard power steering lacks any significant road feedback and also needs pretty numerous adjustments to keep the vehicle on a straight line. The Toyota Hiace is also available with a 4x4 version which offers extra grip, has a higher ground clearance and stronger payload and towing capacities. The Toyota Hiace doesn’t have the same upscale feel as its main rivals and also comes with a pretty dull exterior design and a dated interior which lacks the space and comfort found at Mercedes Sprinter or Volkswagen Crafter. On the other hand, the engines are strong enough to get the job done without whining and even if they aren’t the most efficient units in the segment they score a satisfactory fuel economy. The ride and handling however are the weakest points of the Hiace, while the affordable price and reliability are its biggest advantages over the competition.